Let me tell you something. Although I had only stayed at Pibers for one night at this stage it was immediately apparent to me that this guy was a workaholic. Lets face it ....from the outset this guy had to be a little different from most people. Most people do not create one huge successful business' let alone 3 or 4 like Piber. It's just not normal and the way he operates reflects this. Piber is like a man on a mission. He makes big decisions substantial decisions in seconds and where most people would umm and argh cogitating and deliberating, Piber sees business clearly and sees through the fluff, to the bottom line. He is happiest when he is developing bikes, when he is immersed in tech drawings and when he is surrounded and working with grafters. From what I've learnt in my two visits to Piber to complete this interview ,this is what makes him tick. There is however more to the man than this, much more. So ..... I had the main man Josep Pibernat sitting next to me and we were sitting on the motorway heading for Barc. I had him trapped. It was time to pull the questions out and start the interview. So that's exactly what I did. Boy, did I have a lot of questions for him !!. The interview with be in blue text. The editorial will be in black text. Remember that during the interview, we will also be following the actual time I am with Piber as well so you will have to keep your wits about you. I recommend that you read the interview slowly to fully understand the content properly. In Salt centre, Girona in 1951. What did your mother and father do for work? My father was a carpenter and my mother worked in a clothes factory. ﻿Do you have brothers and sisters? ﻿Are they older or younger than you? And do they live round her? 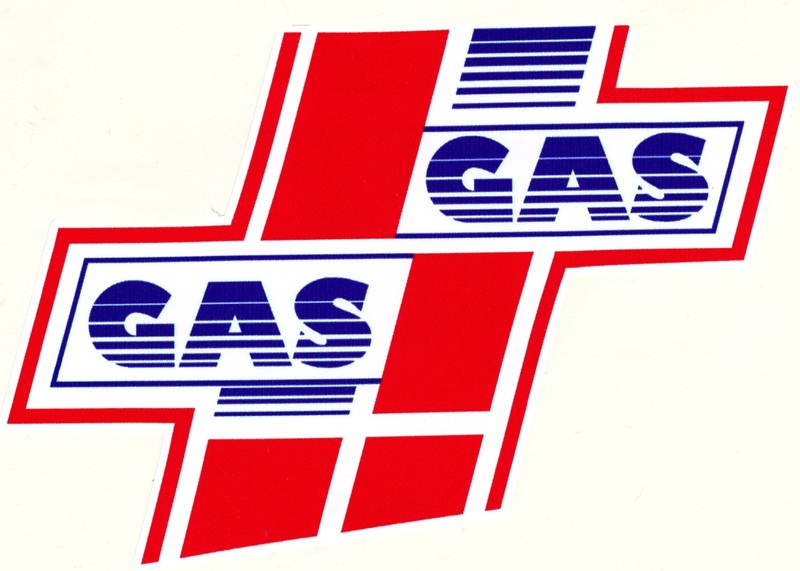 Was your family involved in motorcycles? No, my father have the motorcycles he like, but he not want to drive. Sometimes I take the bike, and when I am 15 years I go to live in hotel and I want to make ride the bike, I make a lot of money, I pay my bike, my hotel and go alone. Vilasonic, I have for maybe 11 years. What was your father’s bike that you would ride? Peugeot 125, this was May in 1955 or 53 maybe. How old were you when you met Narcis? Maybe 8 or 10, we live very close in the same village. You went to the same school? No, not the same school as Narcis is 5 years more bigger than me. I know in the beginning when we first start to ride the motorbike. I go with the Derbi, then at this time Narcis go with the Cota. He was 18 years when we first ride together and I was 12. On Sundays we rode together in the mountains with Dani Font. Dani is the teacher. He was a great teacher and influence on me. Dani Font we follow and learn from him. Narcis follows and then me follow Narcis. What bike would you be riding? 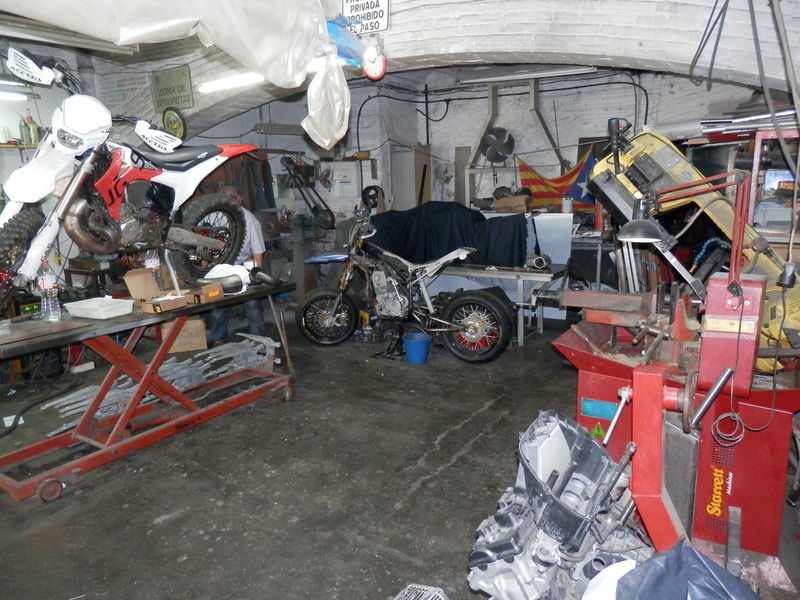 I start with the Derbi 80cc enduro and then the 110cc. Dani later in my riding career would prepare my bike for me. At this time Dani would be riding the Bultaco Matador, Narcis with Cota 247 trial and me with the Derbi. After I buy the Cota of Narcis and Narcis enter the competitions with the Bultaco. After with this Cota, I win the Junior Spanish Championship of Enduro. 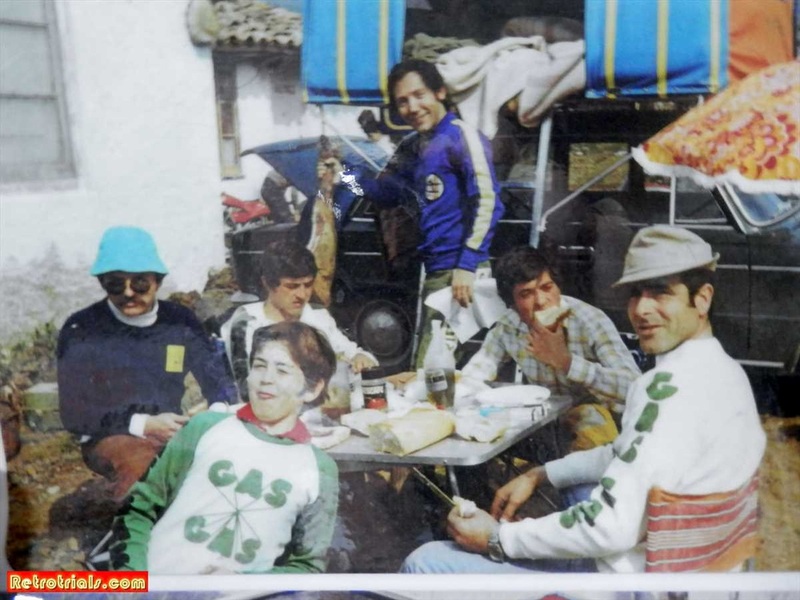 This photo of Dani Font on the right with the hat was taken in the mid 1970's when he was working at the GasGas store. With the Cota ha ha? Yes, now it sounds strange, yes. Then after I enter Bultaco. I have then at 20 years old enter the military and go to America. I was 20 or 21 years. Then I ride in America the six days and I finish and take the gold medal. Later I would ride many competitions. The Paris Dakar and the Inca rally and many many more. Gymkhana was developed in Spain during the 1950's by the factories to offer entertainment, provide a sport and to test the agility of their bikes. 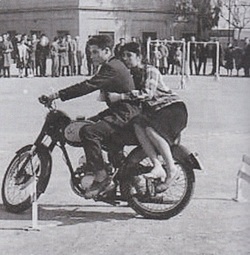 It was one of the earliest off road motorcycling sports in Spain dating way before Motocross and Trial. We've arrived at our destination in Barcelona. 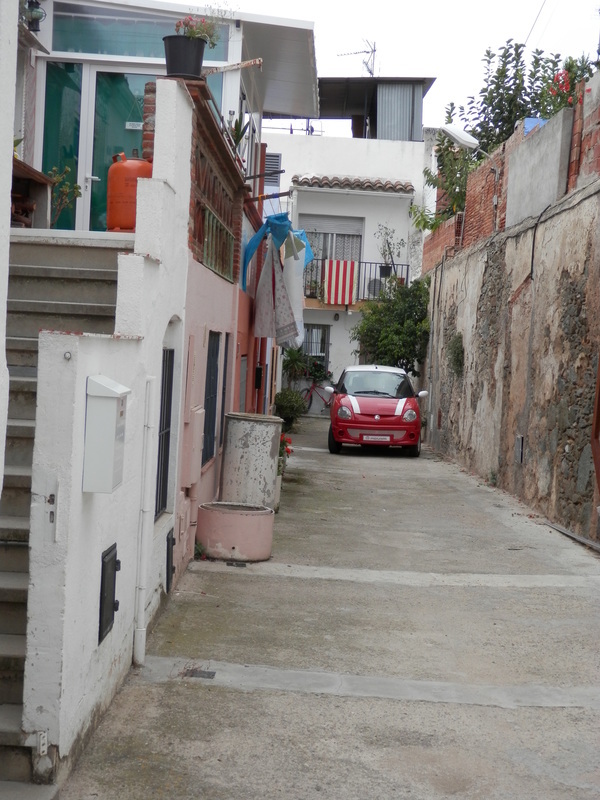 The charming narrow alley lined with small quaint traditional Spanish town houses was a contrast to the tiny aged workshop we had come to see. Stepping inside there was a strong smell of Gasoline, burnt oil and metal. The sponge like, oil soaked concrete floor stood testament to the 60 years this small barrel ceilinged place had beaten and burnt metal into shape. Squares of lighter concrete stood testament to the machines that had once stood there.